What is the Entropy in Entropic Gravity? We investigate theories in which gravity arises as an entropic force. We distinguish between two approaches to this idea: holographic gravity, in which Einstein’s equation arises from keeping entropy stationary in equilibrium under variations of the geometry and quantum state of a small region, and thermodynamic gravity, in which Einstein’s equation emerges as a local equation of state from constraints on the area of a dynamical lightsheet in a fixed spacetime background. The idea that gravity can be thought of as an entropic force is an attractive one. In this paper we have distinguished between two different ways of implementing this idea: holographic gravity, which derives the Einstein equation from constraints on the boundary entanglement after varying over different states in the theory, and thermodynamic gravity, which relates the time evolution of a cross-sectional area to the entropy passing through a null surface in a specified spacetime. We argued that holographic gravity is a consistent formulation and indeed that recent work on the modular hamiltonian in quantum field theory provides additional support for its underlying assumptions. The thermodynamic approach, on the other hand, seems to suffer from a difficulty in providing a self-consistent definition for what the appropriate entropy is going to be. In the title of this work, we asked, “What is the entropy in entropic gravity?” We are now equipped to answer this question. In what we have called “holographic gravity,” the vacuum subtracted von Neumann entanglement entropy (the Casini entropy), evaluated on the null surfaces of the causal diamond, provides an appropriate formulation for an entropic treatment of gravitation. This can help guide further attempts to understand the underlying microscopic degrees of freedom giving rise to gravitation in general spacetime backgrounds. Gravity, one of the four fundamental forces of nature, appears reassuringly constant across the Universe, according to a decades-long study of a distant pulsar. This research helps to answer a long-standing question in cosmology: Is the force of gravity the same everywhere and at all times? The answer, so far, appears to be yes. Illustration of a molecule in the presence of gravitational time dilation. The molecule is in a quantum superposition of being in several places at the same time, but time dilation destroys this quantum phenomenon (Copyright: Igor Pikovski, Harvard-Smithsonian Center for Astrophysic). The Advanced Ligo instrument, a laser “ruler” built to measure the traces of gravitational waves, is progressing at amazing speed, scientists say. 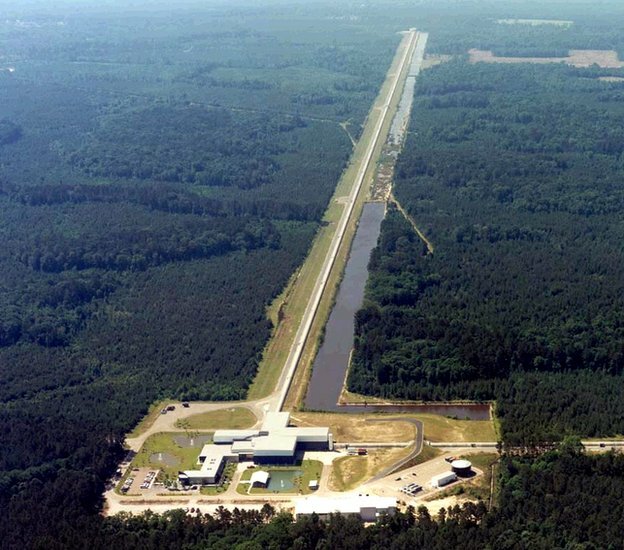 The first generation of Ligo, which ran between 2001 and 2010, saw nothing. Over the last four years scientists have designed a more sensitive detector that achieved “full lock” in June this year, earlier than planned. 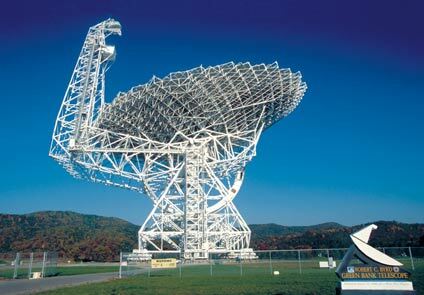 Researchers reported that the new one is already 30% more precise and will start scanning the sky in summer 2015. Ligo (Laser Interferometer Gravitational-Wave Observatory) operates in two sites in the US, one in Livingston, Louisiana, and another one in Hanford, Washington. “In June we reached this state that we call ‘locking’, where the entire system is switched on and behaves for a short time, 10 minutes or so, as predicted it should do in science mode,” said Prof Andreas Freise from the School of Physics and Astronomy of the University of Birmingham during the British Science Festival. Gravitational waves are ripples in the fabric of space and time that propagate across the Universe like sound waves do after an earthquake. Objects of different masses—such as feathers and bowling balls—should fall at the same rate in the absence of friction forces. However, some quantum gravity theories predict that gravitational acceleration may depend on an object’s properties, like its atomic makeup. A new experiment, described in Physical Review Letters, looks for such an effect by comparing for the first time the free-fall accelerations of different atomic elements in the same matter-wave interferometer. The results confirm the universality of free fall and may constrain alternative gravity models. Many experiments over the years have tested free fall with lunar laser ranging and torsion balances. More recently, physicists have used matter-wave interferometry to measure gravitational acceleration of quantum particles. Although not yet as precise as macroscopic tests, interferometer experiments offer the possibility to directly test how gravity depends on quantum properties such as atomic spin. Figure 1 (Left) Neutron mirror apparatus. An ultracold neutron (UCN) enters a space between two mirrors that act as potential wells, giving rise to a discrete energy spectrum. A detector measures neutrons exiting the cavity formed by the mirrors. The bottom mirror sits upon a nanopositioning table that induces a vertical oscillation that produces dips in the neutron transmission at the resonances. (Right) Energy-level diagram for the neutrons in a gravitational field caught between the walls, which oscillate owing to the mirror motion (horizontal direction here is vertical in the apparatus). This, in turn, causes the neutrons to move up and down energy levels. A measurement of the energy-level spacing yields constraints on parameters of scenarios describing dark energy and dark matter, which would slightly shift the levels as indicated by the dashed lines. 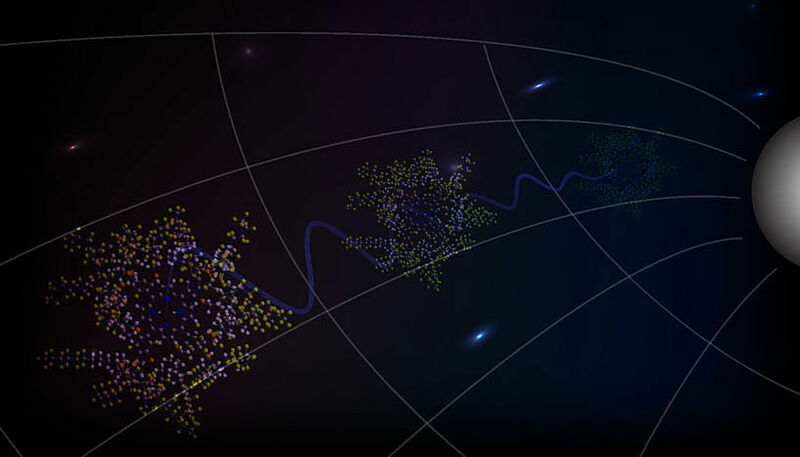 The quantum behavior of a neutron bouncing in the gravitational field of the Earth can improve what we know about dark energy and dark matter. Spectroscopy has always set the pace of physics. Indeed, the observation of the Balmer series of the hydrogen atom led to the Bohr-Sommerfeld model about 100 years ago. A little later the discreteness of the spectrum moved Werner Heisenberg to develop matrix mechanics and Erwin Schrödinger to formulate wave mechanics. In 1947, the observation of a level shift in hydrogen by Willis E. Lamb ushered in quantum electrodynamics. 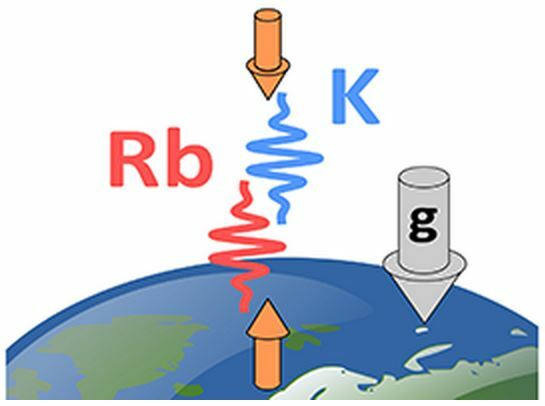 Now, a group led by Hartmut Abele of the Technical University of Vienna, Austria, reports, in Physical Review Letters  [http://arxiv-web3.library.cornell.edu/abs/1404.4099], experiments that once more take advantage of the unique features of spectroscopy to put constraints on dark energy and dark matter scenarios. However, this time it is not a “real atom” (consisting of an electron bound to a proton) that provides the insight. Instead, the research team observes an “artificial atom”—a neutron bouncing up and down in the attractive gravitational field of the Earth (Fig. 1). This motion is quantized, and the measurement of the separation of the corresponding energy levels allows these authors to make conclusions about Newton’s inverse square law of gravity at short distances. The energy wave function of a quantum particle in a linear potential , corresponding, for example, to the gravitational field close to the surface of the Earth, has a continuous energy spectrum . However, when a quantum particle such as a neutron is also restricted in its motion by two potential walls, the resulting spectrum is discrete.